By Charles H. Fairbanks, Junior Archeologist, Ocmulgee National Monument, Macon, Georgia. IN THE popular imagination the archeologist is a mysterious fellow who delves in the ground and periodically emerges with exciting news of some striking discoverya rare object, bones of strange people long since buried, remains of ancient towns and villages, or other material evidence of the existence of man in past ages. He is a sort of glorified ditch digger who, spade in hand, pushes back the boundaries of our knowledge of human life before the dawn of history or adds concrete information to support the written record of the historic past. In reality the archeologist is a scientist whose work requires the use of many and varied techniques. When he drops his spade and trowel and climbs out of his excavation his work is but half done. Armed with voluminous field maps, sketches, and notes, he moves his excavated materials indoors. There, in his specially equipped laboratory, he painstakingly analyzes his finds and compares them with discoveries made at other sites. Then he prepares the detailed reports which announce to other archeologists and to the world at large the real nature and significance of his findings. Using metal profile gage in reconstructing an excavated pot in the archeological laboratory at Ocmulgee National Monument. 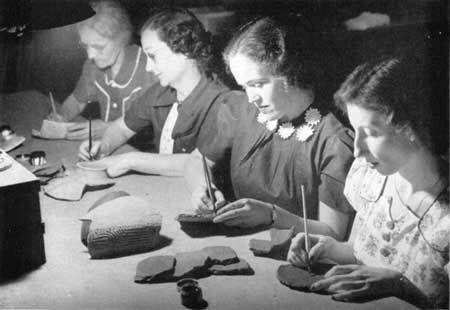 The Ocmulgee laboratory was established for the purpose of cataloging and studying the large collections of pottery and other objects excavated since 1933 at Ocmulgee National Monument, Macon, Ga., and a number of nearby sites. This extensive excavation program resulted in about 30,000 storage boxes of potsherds (fragments of Indian vessels), flint tools, bone and shell ornaments, and numerous other objects of Indian manufacture. The laboratory was established early in 1938. It took over the staff of the earlier field laboratory which had been operating during excavation. Temporary quarters for storage and office space were obtained in the Macon Municipal Auditorium. The staff consisted of 35 clerical workers supplied by WPA, ERA, and CCC, under the direction of two supervisors. The first problem was to catalog adequately all the material and to index the voluminous field notes and observations written by the excavation staff. During excavation the archeologist separates the material into groups according to the evidence revealed in digging. Thus a single field number may be assigned to a single object or to a collection of similar objects from the same location, soil level, house floor, burial, and the like. In the case of whole pottery vessels, stone tools, and similar materials each object is given a separate number. Small potsherds, broken tools, scraps of animal bone, and related objects are lumped together so that all of the materials from one place may be handled at the same time. This segregation depends upon the judgment and knowledge of the archeologist. Notes are taken for each separate piece on the surroundings, soil condition, associated objects, depth, or other items of significance. The notes, together with a running account of the excavation, are returned to the laboratory where they are typed, indexed, and preserved for future reference. 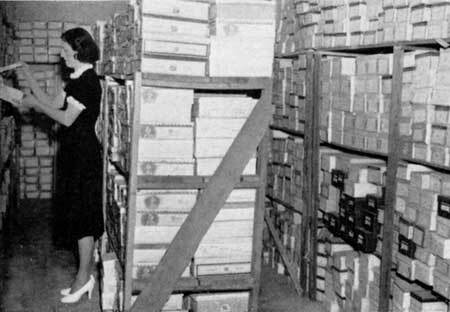 The purpose of cataloging is to make each collection readily available for analysis together with the notes describing its discovery. In the laboratory a number is first assigned to each object or collection. This consists of a serial number and an abbreviation identifying the site by county. This is written on the object in India ink, or, in the case of beads and other small objects, on an attached tag. The number also appears in the upper left corner of the catalog card as shown in the accompanying illustration. The catalog card also contains (at the left side) references to various notes, profiles, maps, or photographs of the material. On the right side of the card are recorded the site name, field number, horizontal location, depth, and associations, together with a description of the material. The location in the storage spaces is given at the bottom. The cards are typed in triplicate and filed by master catalog number, site (geographical unit), and by material (bone, stone, shell, or pottery). When the catalog cards are completed and filed it is possible to learn all the information available by consulting the file under any one of the three headings. More than a million objects have been cataloged in this manner. These fall into some 35,000 collections representing either single objects or boxes of sherds, flint, or bone fragments. This large number of objects is temporarily stored in approximately 10,000 boxes, 10 exhibit tables, and 35 feet of shelves for whole vessels. The great majority of this mass of material came from the Macon plateau and the Lamar tract, the two areas of Ocmulgee National Monument. Identification serial numbers are written in India ink on pottery fragments when excavated objectes are catalogued. The second phase of work in the laboratory is the preservation and restoration of excavated material. All human bones from burials, as well as bone tools, such as awls, punches, and needles, are strengthened by saturation with a solution of synthetic resin in acetone. Shell beads and ornaments must be cleaned carefully before they are strengthened with the same solution. Wood and charcoal specimens are preserved by soaking in a mixture of paraffin and gasoline which makes them more easily handled by the dendro-chronologist. These wood specimens are vitally important because it is hoped that exact dates for the various occupations can be determined from a study of the climatic changes as recorded by the growth rings. Copper ornaments from the historic Creek occupation are cleaned with chemicals to prevent further corrosion, and reveal something of the original appearance. These copper bells, buckles, bracelets, and other ornaments, when cleaned of the green patina, reveal an attractive yellow color that readily explains why copper was such a favorite article of trade among the Indians. Many glass beads from the Creek village and shell beads from the earlier settlements must be strunga considerable task when it is considered that more than 26,000 minute shell beads were found with a single burial. Temporary storage of cataloged objects. Finally, the pottery vessels which have been crushed by burial in the earth or broken by the Indians must be restored to their original form. The first step is to fit and glue together all the pieces recovered. In many cases it is then simply a matter of filling in with plaster of paris a few small missing fragments. Often, however, only a third or a half of the vessel is found. 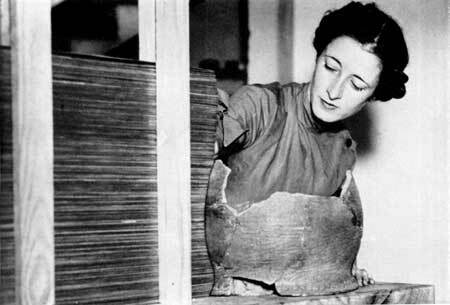 In this situation it is necessary to construct a mold of clay by the use of the pottery wheel to support the sherds while the lost section is replaced. This is done only in cases where similar vessels are at hand in sufficiently intact condition to indicate clearly the shape of the missing parts. The reconstruction of badly broken vessels from as many as 200 pieces is often an extremely delicate task compared to which the most difficult jigsaw puzzle is child's play. The work of the restoration unit provides material for museum exhibits and enables the archeologist to get a better picture of the objects as the Indians actually used them. Triplicate cards are filed by master catalog number, by site (geographical unit), and by material (bone, stone, shell, or pottery). The third function of the laboratory is to analyze the materials with a view toward making technical reports. Analysis depends upon the habit of human beings to make things in "style." Thus the various Indian settlements on the Ocmulgee had different styles of pottery, tools, and ornaments. Within a single group these styles changed with time or the influence of other groups. The archeologist calls these styles "types" and by careful study identifies the various types, their changes, and relationships to other types. *From The Regional Review (National Park Service, Region One, Richmond, Va.), Vol. III, No. 3, September 1939, pp. 9-13.